*Well, as expected, “Straight Outta Compton” went straight to the top of the box office this weekend, taking in an estimated $56.1 million dollars. Still looking good and coming in at umber 2 in the U.S. and Canada, Paramount Pictures’ “Mission: Impossible — Rogue Nation” added $17 million in its third weekend. Warner Bros.’ “The Man from U.N.C.L.E.,” another new offering, debuted in third with $13.5 million, on par with tracking estimates, reports the LA Times. A lot of so-called experts initially didn’t expect “Compton” to open strong as it did says Nicholas Carpou, Universal Pictures’ head of domestic distribution. Actually being the top theater draw is only part of the story. It seems things had cooled off box office wise and the “Fantastic Four” reboot wasn’t the hero the industry was waiting for ’cause it bombed big. 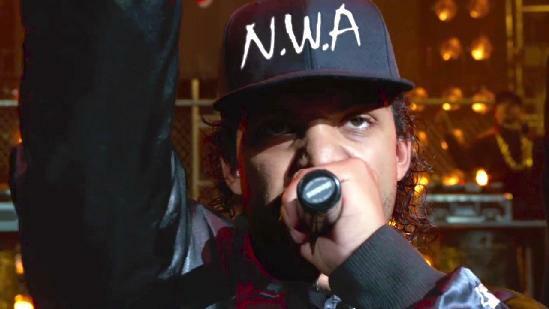 But along comes “Straight Outta Compton” and suddenly the box office picture is looking to be all good again. Research firm Rentrack says this weekend will be up about 2% versus the same weekend a year ago, when “Teenage Mutant Ninja Turtles” led with $28.5 million. Year-to-date, the box office is up about 6%. But what do moviegoers have to say about the film. In a word, they LOVE it! CinemaScore says most are giving an “A” grade. However, unsurprisingly there are some critics who didn’t quite share the vibe audiences felt, but nonetheless reviewed it positively. Over all it got an 88% positive rating from critics on Rotten Tomatoes. As far as the audience breakdown, it attracted younger demos overall as well as black audiences. About 51% of ticket buyers were younger than 30, and 46% were black. And here’s a surprise to some: About 52% of the audience was female. You can find out MORE about the this weekend’s box office at LA Times.